You are here: Home>Format>Photo>Painting of Pen Y Crug Farm in The Silent Valley or Cwm Merddach by Marilyn Hilgartner. 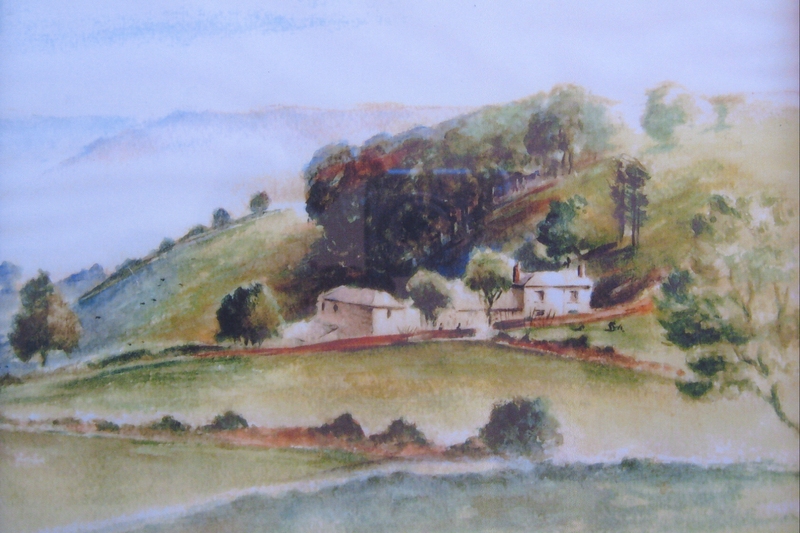 Painting of Pen Y Crug Farm in The Silent Valley or Cwm Merddach by Marilyn Hilgartner. Pete Waterman Rail Special,Davies the Ocean. Alan James, Milkman, delivering milk in Augustus Street,Victoria. Celebration photograph outside the Oak. Childrens play at Presbyterien Chapel. Class of Pupils in Tyllwyn School Hut. Construction Gang building St.Matthew's Church in Tyllwyn. Construction Gang laying Foundations for St. Matthew's Church,Tyllwyn. Cornish pump engine at Marine Colliery site. Cuthbert Phillips of Victoria,Wales Football International,1931 to 1935,played for Wolverhampton Wanderers. Cwm Male Choir and Sonlight Singers. Cwm Sunday School Union. New Presidency. Cwm,view North to Betterment Field. Cwmyrdderch (Top) Junior School,Festival of Britain practice for a display at Ebbw Vale Rugby Ground. Dedication of Foundation Stone of St.Matthew's Church,Tyllwyn. Dedication Service of new St.Matthew's Church Tyllwyn. Demolition of Cwm Institute,after structural damage. Demolition of The Pickler on the Corus Site. Early View of Cwm looking N.E. Ebbw Vale High Level Station L.M.S and L.N.W.R.view south towards the Crossing. Ebbw Vale Parkway Station, opening of Rail Link to Cardiff on 6th February 2008 after this line was closed to passenger traffic in 1962,a gap of 46 years. Ebbw Vale Parkway Station,opening day 6th February 2008. Ebbw Vale Steelworks,demolition of The Pickler by Tyllwyn. Edward,Prince of Wales visiting No 5 Pit by Garden City in 1918,this pit was then named after him. Edward,Prince of Wales visiting Roch Street, Abertillery. Edward,Prince of Wales visiting the Depressed Areas of South Wales. Edward,Prince of Wales, visiting a derelict Steelworks site in South Wales. Edward.Prince of Wales speaking with ExServicemen in South Wales. Eugene O'Callaghan of Victoria,Wales Football International 1929 to 1935,11 caps 2 goals.Played League Football for Tottenham Hotspur,Leicester and Fulham. Eugene O'Callaghan,Wales Football International 1st Cap 2nd February 1929. Flood at bottom of Crosscombe Terrace. Football International at Cardiff.Result Wales 0 England 4. Foundation Stone laid by The Bishop of Monmouth. Garden Festival Wales Construction,view South towards Cwm. Garden Festival Wales landscaping 1990 view South. Garden Festival Wales site landscaping. H.M.V.Recording Star,Reginald Dixon,who gave a Concert in aid of The Second World War Effort. Heavy end of the Ebbw Vale Steelworks viewed to the N.W. from Waunlwyd. Last Jones's Bus to Pass through Tyllwyn. Last Train at Victoria Station before the G.W.R.line closed to passenger traffic,view North. Long Service Retirement Members Of R.T.B. Mechanical Engineering Dept. Marine Colliery Pit shaft No. 2 taken from Pit shaft No. 1. Marine Colliery,closure 1989,view from The Rhiw. Mark Williams ,World Snooker Champion 2000 and 2002,U.K.Champion 2002,Masters Champion 2002.
members of Paran Chapel Manmoel. Monmouthshire Railway Society Special at Victoria. Munitions Workers at Ebbw Vale Steelworks during World War 1. Official Opening of The Miner's Memorial near The Cwm Marine Colliery Site. Original Window in St.Matthew's Church,Tyllwyn. PCWilliams taken at 4 Brighton Terrace, with Newcombe Terrace in the background. Quoits International in Hardgate,Glasgow in 1955 between WALES and SCOTLAND. Removal of railtrack at Ebbw Vale High Level Station,L.M.S.line. Road painting on the Cwm Road, 1940s. Royal National Eisteddfod Of Wales held at Ebbw Vale 4 to 8 August 1958. Ruins of Tyn Y Gelli Farm and the residue of The Waunlwyd Slag Tips in The Silent Valley. Slag Tips in 1986 being demolished in preparation for Garden Festival Wales 1992. Slag Tips opposite Waunlwyd view South. Snow Scene in Ash Grove,Tyllwyn. St Mary's Church Waunlwyd prior to the Garden Festival. Stained Glass Window dedicated by The Bishop of Monmouth. Stephenson Rail Special passing through Cwm Station. The Herbert family of Manmoel. The Old Road to Cwm looking North. The people of the Waterwheel, Waunlwyd, on a day trip to Barry Island. The Pickler after Demolition, view across to Ebbw Vale. The Pickler before Demolition on the Corus Site, view across the valley to Ebbw Vale. The Pickler,last building of the Corus site to be demolished. Tottenham Hotspur Football Club 1932. Tottenham Hotspur players Willie Evans and Eugene O'Callaghan,both were from Victoria. Troed Rhiw Clawdd Farm on The Domen Fawr. Tyllwyn Old Age Pensioners Hall,Official Opening. Veiw of The Domen Fawr taken from the cemetery road. View from the top of Waunlwyd Tips. View North from Queen Street,of Victoria Mixed School and Augusta Street. View North of Augusta Street,Bethel Chapel,and Ebbw Vale Steelworks. View North to Garden Festival Site from the mountainside above Cwm. View of Cwm and Cwm Merddog. View South to Cwm from Construction Site of Garden Festival Wales. Wales and England Football Internationals arriving at Cardiff Station. Wales Football International.Result Wales 5 Scotland 2 .Eugene O'Callaghan scored 2 goals. Wales Football Team in Belfast 1933.Wales 1 Ireland 1. Wales Quoits Team v England played at The Custom House,London.This was the first time Wales 219 pts beat England 203 pts away. Waunlwyd, General. Station Road before demolition. Wedding of William Mills and Irene Long, taken in the garden of 61 Curre St. These are the most popular locations used on the site. The more popular the keyword, the bigger the font size. View all the locations used in this catalogue.